Back in 2012, the gaming world was taken by storm by the announcement of the OUYA, a crowdfunded attempt at creating a major console platform geared specifically towards indies. Though we could easily write a thesis on all the reasons why the OUYA ended up being an enormous failure, the hardware did have some saving graces, such as the excellent TowerFall. TowerFall was a couch multiplayer favourite thanks to its fast-paced, arcade-like gameplay and surprising depth, and we’re happy to report that absolutely none of that magic has been lost in the transition to Switch; in fact, given the console's focus on local multiplayer, you could argue that it's the perfect home for the game. TowerFall is a relatively simple game from the outset, best described as something of a cross between Super Smash Bros. and Balloon Fight. A standard match consists of up to six players each taking control of an archer, battling for supremacy in small, one-screen maps that have wraparound physics; if you drop through a hole on the bottom of the screen, for example, you’ll pop out at the equivalent location on the top. Killing another archer is a simple matter of either impaling them with one of your arrows or jumping on them like a goomba, but dexterous players can avoid elimination by usage of the dodge, which has the handy second function of catching all otherwise fatal arrows during the animation. Rounds typically last a little less than a minute, depending on how many players are involved, and once there’s a 'last man standing' situation (or none, if a sneaky last arrow found its mark), the next round starts on another map. Though the core premise of a game of TowerFall is quite simple, there’s a considerable amount of strategy that goes into winning. For example, you have to retrieve arrows if you want more shots, so players that empty their quiver early on will be relatively defenceless compared to those who have played more defensively. Another example is how arrows can be shot through the sides of the map, meaning that a potentially risky shot may just manage to catch an unassuming opponent off guard. 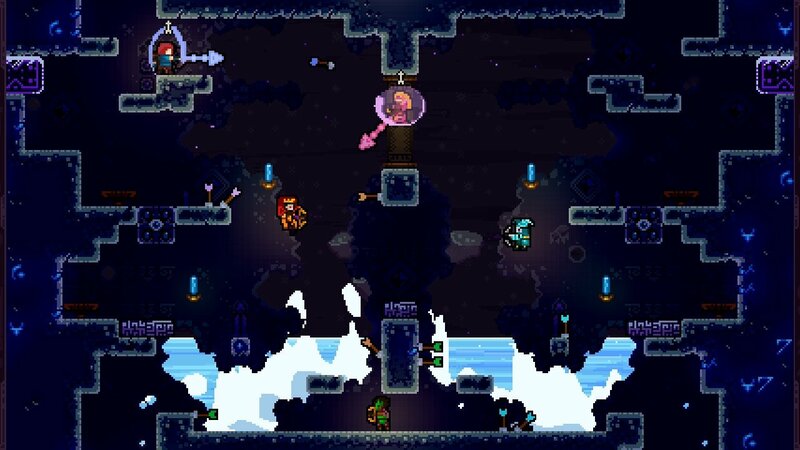 Every second of TowerFall is an elaborate dance, an intense and thrilling period of jostling for superior positioning while being constantly mindful of everything happening around you on-screen; make one mistake, and you’ll find yourself dead before you’re even aware the mistake was made. 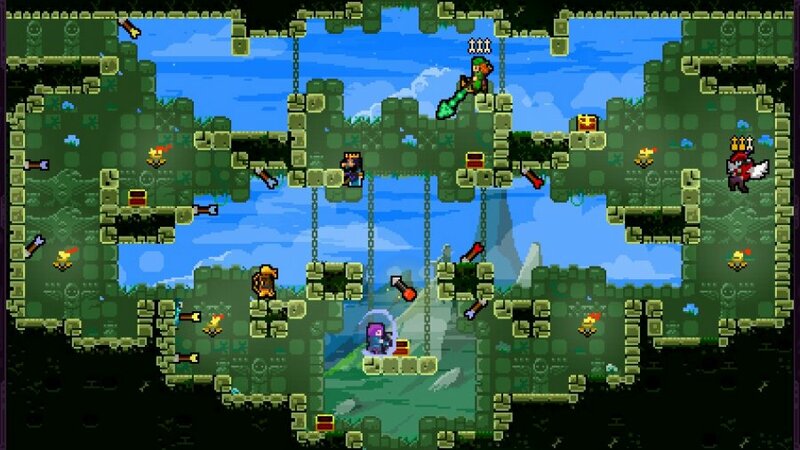 TowerFall would be a fantastic game if it were just the standard three-arrow setup, but much of what makes this such a high pick for a local gaming session can be found in ‘Variants’, various parameters that can be set before each match to change the playstyle. There’s a large suite of power-ups and items to randomly spawned in battle, for example, like shields, running shoes, or explosive arrows, and getting these can mean the difference between victory and defeat. Rules can be changed from the outset, too, such as giving arrows greatly increased homing capabilities or allowing felled players to take revenge on their opponents post-mortem by controlling a ghost. There are dozens of options on offer in both categories, allowing for a nearly limitless amount of combinations and game types, and the ability to randomize the Variants for each match makes the experience feel fresh every time you play. The maps add a notable element to mixing up the gameplay, too; although they all adhere to roughly the same overarching design principles, different stage gimmicks give each map its own personality, sometimes necessitating different strategy. For example, one map has Thwomp-like rock enemies crashing back and forth, while another has pits of green goop that limit your speed, jump, and dodge. It’s inevitable that some maps will become favoured over others, but the distinct gimmicks that characterize each map go a long way towards keeping the experience from getting too stale; they’re just different enough that each one feels unique, but not so much that one has to completely change their playstyle each time. All of this combines to make for an experience that has a surprising amount of layers for such a simple arcade game. No two games are quite the same, not just because of how different each match can be due to Variants, but also that all-important luck factor that often determines the victor. Regardless of how thoroughly you may have mastered the mechanics, it’s quite likely that a random arrow may miss its intended target and bury itself in your back instead, or a misfired bomb arrow may blow up in your face. Matches are so quick and so organic that all involved players can hardly keep from howling and shouting at every major play that happens, whether it be a split-second dodge that decides a match win or a desired power-up being scooped by a quicker opponent. That constant promise that the next round will likely prove to be just as dynamic and surprising as the last round is what hooks the players, as personal vendettas and the relatively quick runtime of each match lead to someone demanding ‘just one more’ over and over. 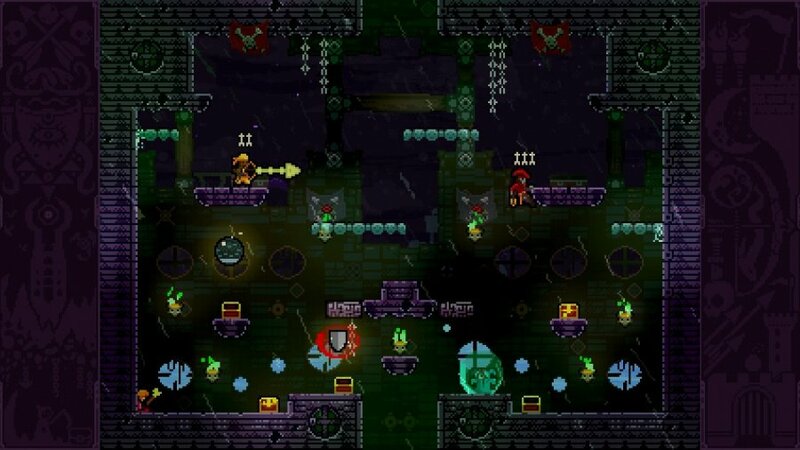 Though TowerFall is best experienced with friends locally, there’s also some relatively in-depth single-player content to keep solo players interested. Quest mode acts as TowerFall's horde mode, seeing the player choosing a map and doing their best to hold their own through a fixed series of rounds against an onslaught of monsters and AI controlled archers. 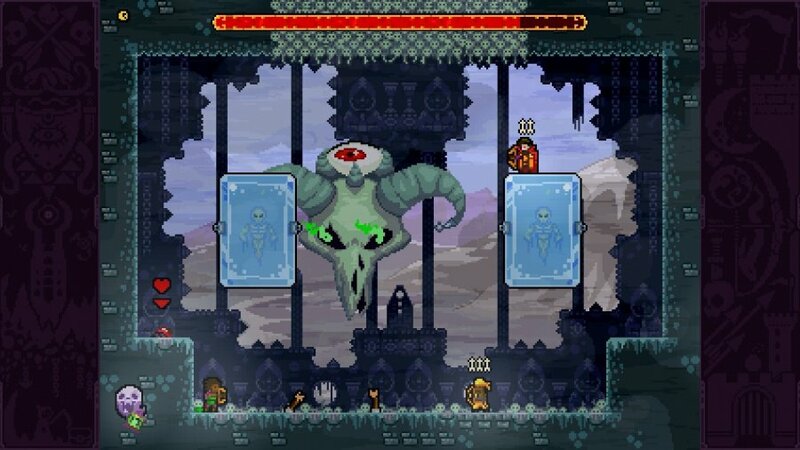 Dark World mode is similar, but instead sees the player battling through a series of levels to reach a boss fight at the end. Wrapping it all up is Trials mode, which challenges the player to find the quickest and most efficient route way to destroy a series of scarecrows placed on a map. Each of these modes does a great job of offering up supplementary content that helps one to hone their skills for when friends aren’t around, and though there’s plenty of challenge on offer here, it must be said that there isn’t a whole lot of depth, certainly not enough to justify buying the game if you’re not one to play with friends on the Switch much. There’s something to be said, too, about the way in which TowerFall handles the concept of mystery, gradually introducing new maps, characters, powerups, and more as you put in more hours. Upon winning a match, for example, a victor may find themselves suddenly challenged by a new character controlled by AI, and defeating it unlocks that character for use. Or perhaps selecting the ‘random’ option on the map screen will see a brand-new location suddenly rise from the sea, ready for use. The way in which TowerFall introduces this new content to you, through a mixture of randomness and paying attention to subtle clues the game leaves, is something that isn’t done enough in games nowadays, capturing a certain sense of wonder as it makes the player think what else the game might be hiding, or what a new cryptic hint could mean. We would highly suggest you refrain from spoiling these unlocks and mysteries by looking them up on the internet, as the process of finding the content naturally has a certain kind of magic that can never be recaptured. Now, what may come as a drawback to some players is the lack of online play, which does seem to be a bit of a strange omission for a game so heavily geared towards playing with multiple people. Indeed, the inclusion of online would’ve made for a more well-rounded package, but its absence isn’t something that necessarily detracts from the experience, as much of the enjoyment comes from playing with people you know, sitting in the same room as you. 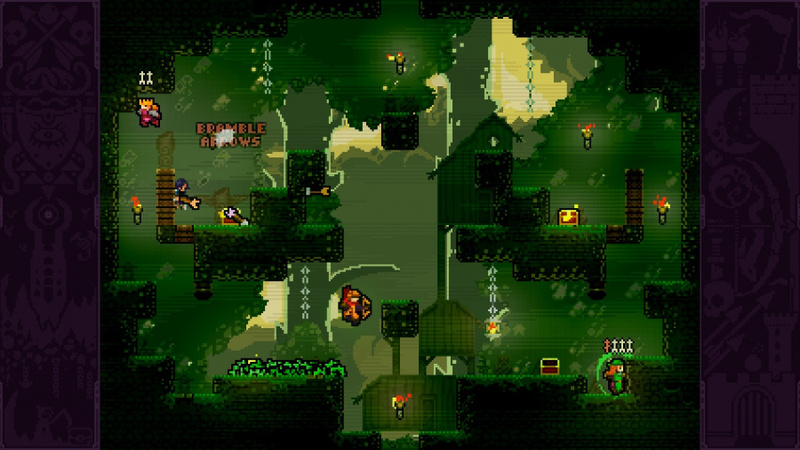 TowerFall feels like a complete experience as is, and it more than justifies the cost of admission, but those who prefer to play games online may be disappointed by the focus on local play. Naturally, the Switch version of TowerFall is the definitive version to play, not just because of its portable nature and the split Joy-Con for multiplayer, but because there’s some extra content to sweeten the deal, too. Madeline — the starring character of the sublime Celeste — is now a playable character (along with her alter-ego, Badeline) and a handful of new Variants have been added to change up the gameplay further. 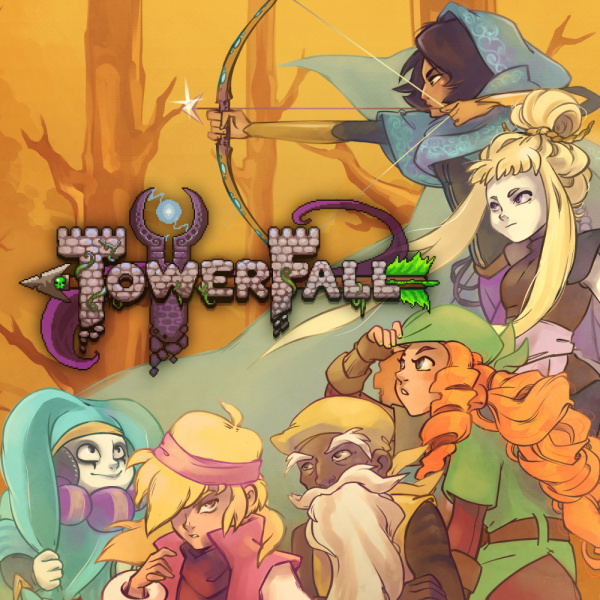 Though this new content isn’t a game changer, it definitely does make this the most complete version of TowerFall to date, and coupling that with the portability of the Switch means that there’s never been a better way to play TowerFall. Matching the stellar gameplay of TowerFall is the equally excellent presentation, particularly showing a keen attention to detail. Graphics are presented in a colourful 16-bit style that’s both functional and eye-catching, making for a visual experience that seldom becomes boring. Each map is memorable and detailed in its design, such as an undersea city encased in glass or a village of huts suspended on stilts in a rainforest, and little things like cracks in the undersea glass or torches flickering in the trees make for environments that feel organic. All of the action is backed by a triumphant soundtrack, leaning hard into soaring melodies and pounding percussion to get players pumped during each play session, expertly creating an air of excitement and intrigue. TowerFall sets the standard for excellence in local multiplayer, creating a fun and endlessly replayable experience that’s sure to be a blast every time you play. Although the single-player content is a bit thinner than we’d like and the omission of online may be disappointing to some, we’d argue that there are few games that better exemplify the unique multiplayer strengths of the Switch. We’d give TowerFall a high recommendation to anyone looking for a great party game for their Switch; the easy to understand mechanics and near-bottomless depth will ensure that this one will be a house favourite for years to come. Is EVERY game on this website a 9/10? I mean, ridiculous. Rare to see another score. Been really keen to play this for a while now. Leaving it on the watch list for now though until I find people who will play it with me. Great game, grabbing this for the Switch and six player play. @mj2k18 There sure have been a lot of 9s, but in NL's defense, a lot of well received and successful indi-games of the past few years are coming out all at once on Switch (this one has an 87% on Metacritic). Probably due to Switch being relatively new and unexpectedly successful. No, the Switches library is just that darn good. A far cry from the Wii U days and only 1-2 releases on eshop per week. Great! Did not play it on steam but will pick this up as I type for a nice beer drinking smack talking game on the Friday night with friends. @mj2k18 I feel like the average quality of games has just been really high lately, been having trouble finding time to play all the great ones. I haven't played TowerFall but my understanding from multiple sources would suggest that 9/10 is a deserved score. Nice, I'll get this once a sale is abound. Towerfall is one of my favorite couch multiplayer games of all time, I'm absolutely going to triple dip. The headline of this article reminds of the "this would be perfect for Switch" memes. Played it with my friend on Xbox some time ago. I knew it was "perfect for Switch" - as easily as these words are thrown around - the millisecond this one was announced for it. Nice to see I've bet on a safe horse. Been waiting a long time for this. Got it, love it, the Switch's expanding library makes me very happy! @mj2k18 I'll second what others have said in that you see a lot of scores in the 7-9 range simply because Switch is getting a ton of great games these days. Beyond that though, even though NL is reviewing a bunch of games each week, there are just about an equal number of games that they are not reviewing. I recently went through all these games to see if I missed any hidden gems that NL did not review, and aside from a few good looking games like Mini Metro, Old School Musical, and Shikhondo that surprisingly did not get reviews here, most of the unreviewed games looked like the dictionary definition of shovelware. Had those all gotten reviewed as well, I'm sure you'd see a lot more scores in the 5 and under range. Great review. Thanks for the comments about the sense of mystery regarding unlocking new stuff in the game. Even though a lot of games you guys review are not my cup of tea, your subheadings only get better!!! And of course: nice and thorough review this one! Naturally I’ve had this preloaded since that was possible, haha. I love it on PS4. Perfect game for a group. I hate the term "couch co-op". Nearly as bad as shmup! To me it's "co-op" and "shooter". They were around first. Later versions should adjust - eg: online co-op and FPS. @HalBailman shmups are not the same as shooters at all. I wanted this but once I know it was local multi only i knew (based on the type of game it is) I would have to pass. . Online and I would have it. @mj2k18 A valid point, though I would say this is the case for a number of reasons. For one thing, there's just a glut of excellent games releasing on the Switch every week, largely in part to the fact that there's a years-long backlog of amazing indie games from other platforms (like Towerfall) that are being ported over to the Switch. Generally speaking, these ports are just as good as their original releases, but often they're even better because the developers put in a little more time to make the Switch version "definitive". The other factor is simply the bias in what we choose to review. Take a look at the "New Releases" tab on the Switch eShop, and you are certain to find dozens of shovelware titles that aren't worth anybody's time. I'll grant you that not all of them are bad, and many of them are probably pretty alright, but I'd also argue that in a period like this where so many high quality games like Towerfall are available, there's little place for "okay" games in a gamer's backlog. We're sometimes surprised--positively or negatively--by a game's quality, but we generally skip games that seem highly unlikely to be anything more than decent at best. @JamesJose7 In the old days "shoot em ups" was a shooter or shooting game, and it's still commonly used, even on this website.. As for shmup, it's abhorrent. @mj2k18 In case you hadn't noticed, the Switch has become THE platform for indie titles, so we're seeing pretty much any indie game of note from the past few years come to the eShop. Not really our fault that everyone has jumped on the Switch bandwagon. @klingki You've hit the nail on the head. We're having to avoid a lot of stuff purely because we don't have the capacity to review everything, and as a result, a lot of reviews will now have decent scores - stands to reason, as we're ignoring the shovelware that would fill the site with 5-or-less score reviews. Best couch co-op game I have played in a long time. Even my dad got into it and have never got him to enjoy a computer game in my life! 3-4 players plus are needed though, 2 player doesn’t do it justice. I have the same feeling, but could also defend Nintendolife. I would rather see scores with an accuracy of one decimal. Celeste was stellar, so I'll definitely pick this up at some point. I still have my OUYA hooked up in my bedroom. I have all the emulators on it, and a certain streaming software, and it's perfect for both. I can see why it bombed, but I've still got a soft spot for it. I'm amazed to see new things being developed for it on the store too. @BizzyBum If you have a PS4, you can play that version online using Screen Share. It works great. That's a "maybe" for me due to the sheer number of such games already available or upcoming. Still holding out for InvisiGun and Duck Game. Guuaaahhh reading this review makes me miss my high school/college/post-graduation-loser-living-back-at-Mom's-house days when I would regularly get people together for multiplayer game nights. That happens like... maybe once a year now if I'm lucky, which just might be enough to make me pick this up anyway because it sounds pretty awesome. I liked this game a lot when I tried it on PS4, but I'm uncertain how well the aiming and such works on a single joycon (assuming you can play it with a single joycon), anyone have any feedback on this point? @DeltaPeng me and the brother played with split joy con last night as he forgot his switch, we loved it! Neither of us moaned about using split joy con. Played this last night with my two older children, 11 & 13 and we had a riot. It was so funny. Two people shooting each other at the same time, jumping on someones head by accident, blowing yourself up with a bomb arrow... And then watching it all back in slo-mo. I cannot imagine the carnage that a 6 player game would bring. We play a few games on local multiplayer but this was as much fun as we have had for a long time. Are you guys actually complaining about the Switch receiving a lot of good games? Or are you complaining about this website reviewing mostly good games? Would you have it review more bad games then? Or would you simply like to have more bad games in general? I'm amazed by people sometimes.